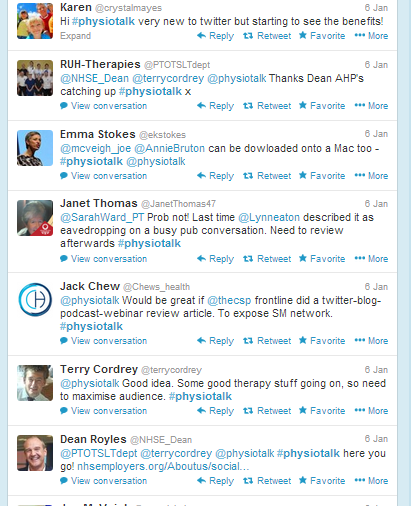 We had another busy #physiotalk chat on Monday on making social media work for you and lots of people reported finding Twitter a useful source of information and resources. During the chat, and since, a number people asked about how to keep track of and save useful tweets and information found on Twitter, both for reference and also to use as evidence of CPD. So, here are a few ideas that I couldn’t fit into 140 characters. It’s written roughly in order of increasing complexity, so hopefully something for everyone but let me know if anything isn’t clear and I can edit this post or chat via Twitter. There are lots of ways to keep a record of social media activity, so the most important thing is to pick the method(s) that suit you best – and be organised! You can mark useful tweets as a ‘favorite’ and this will save the tweet for later so it is much easy to go back and find when you need to. The favorites ‘button’ is at the bottom of a Tweet and this is by far the quickest and easiest way to keep track of useful information and conversations and can be invaluable! All your Favorites can then be found in your favorites list (see more info here) and if you favorite one tweet that is part of a conversation then when you click on that tweet it should then open up the whole conversation. (I have used American spelling of favorite here for consistency with Twitter). If you are using Twitter from your computer you can email a tweet to yourself or anyone else by clicking on ‘more’ at the bottom right of the Tweet. You can also embed Tweets into a blog post (see picture below). The Android Twitter app gives you a few more choices, including sending it by text message, adding it to Dropbox or to your notebook app (apologies, not sure about the Apple App?). A screenshot is a quick way to take a photo of a tweet or short twitter conversation, and also print it out if you need to. To take a screenshot from your computer just press the control key together with the print screen key (top right corner) and then paste it into Word, Paint or other programme and then you can crop and edit it and/or print it. You can also take screenshots from your smartphone (but how you do this will depend on make and model). If you have Dropbox on your computer you can set it up to automatically save your screenshots. It should prompt you to do this the first time you take a screenshot. Obviously you are limited to what you can see on one screen at a time so you might need to take more than one screenshot if you want a record of a number of tweets. 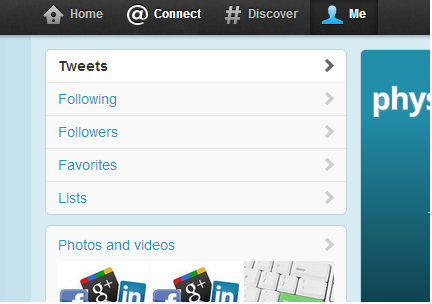 You can save and file resources you find on Twitter to go back to when you need to or at a more convenient time. This might just be bookmarking the website on your internet browser, saving information onto your computer, or saving somewhere like Dropbox, GoogleDrive or Evernote. I personally use Dropbox – the App works well on my smartphone and other family members use it. For members of the Chartered Society of Physiotherapy there is also the option of saving evidence of activity and learning from Twitter on the ePortfolio. This way you can insert a web address/URL into a reflection form or other record of CPD or upload and also link to images, including screenshots of tweets. Adding a web address/URL for a couple of stories from Storify (see below) into a refection form and adding reflection underneath – once you have saved the form then the web link works when you click on it, which is really useful. There doesn’t seem to be a hyperlink option to I just copied and pasted the URL in to the form. I have also been able to upload screenshots of useful tweets as an file into Pebblepad and link them to reflection forms. You can also tag any of your entries, so I have been tagging them Twitter so far to keep easy track of them. You can use Storify to gather together tweets and other social media and internet content into one place in a sequential order, write comments and create a ‘story’. It’s particularly useful as a summary of social media activity at an event or conference, and once a story is ‘published’ it is easy to share by email, Twitter, Facebook (or add the URL to PebblePad documents). You can also follow other people to see their stories,. However, Storify like Twitter is in public domain, and it is designed to be web-based rather than print-friendly so it might not suit everyone for documenting learning and reflection from social media. 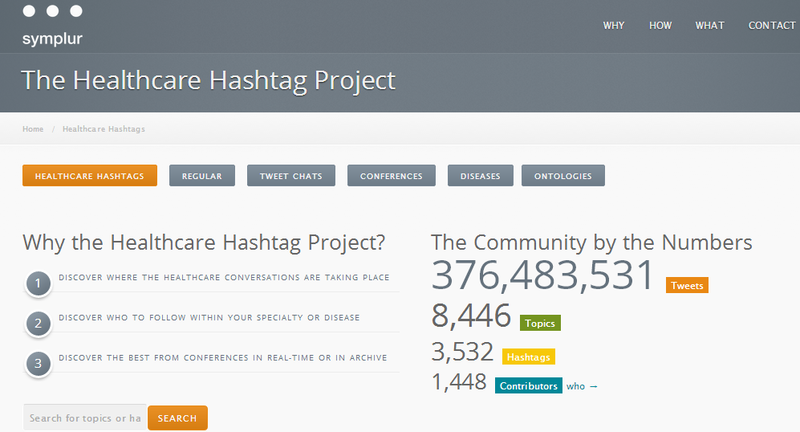 Here’s an example of Storify in action from a Department of Health conference last year. Great list! I would also add that with Evernote and the “read it later” service Pocket, you can email a twitter link to your account to save it there. Pocket will actually save the entire article to your account just from the link and you can read it offline on your mobile device! Another (advanced level) service is Ifttt (“if this then that”) where you can create “recipes” linked to your web accounts. An example of a recipe might be “if I star a tweet, the link gets sent to my Evernote account.” It’s a great service for power users!